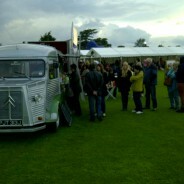 We always get excited at the thought of food festivals, especially when taking place in Somerset. The selection on Cheese and Cider is second to none! 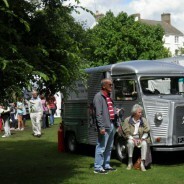 We were pleased to be invited along to the first Burnham-on-sea food festival by Bev and Sarah. Our mission (that we chose to accept) was to “provide the attendees with a selection of delicious whole leaf brews”. 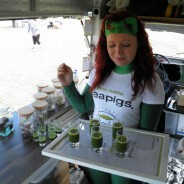 With excitement and more than a tinge of sadness we loaded up Cedric for his final leg of the teapigs tea tour. The venue, Oake Manor, for Somersets very own ‘Party in the Park’ a weekend jam packed with live music, festivities and of course a rather fine teapigs Tea Van. The penultimate event on the 2012 real tea tour was the Strumer of Love set in the picturesque surroundings of the Blackdown Hills. 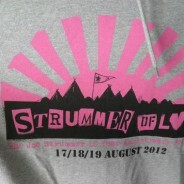 The Strummer of Love festival was created to celebrate the man and the legacy of Joe Strummer and to commemorate the anniversary of what would have been his 70th Birthday. 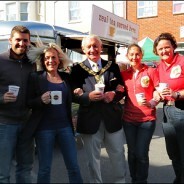 Event number seven on the teapigs Real Tea Tour was the Taunton Flower Show. Having lived in Taunton for a combined 33 years we have never previously attended the show. In our naivety we heard “Flower Show” and envisaged chrysanthemums and antihistamines, we are pleased to say that we were very much mistaken!